There is something about a well-presented meal that makes it taste all the better don’t you think? Well there is for me, I eat with my eyes as my mother always tells me. So learning to not only be able to cook great food but also have it look impressive once on the plate has always appealed to me. Braxted Park Cookery School has such an eclectic range of cookery courses on offer I was spoilt for choice really on what one to start with. I opted for Modern British cooking as the menu quite simply sounded like a sumptuous feast of traditional cooking with a quirky contemporary twist. The state of the art kitchen was amazing; within about half hour I could feel myself starting to believe that I was a Michelin starred chef. This dream would have been a lot more believable if I hadn’t had to throw away the first batch of chocolate I was melting for my cheesecake because I’d stirred it too much and it wouldn’t meat. That’s what I loved about my time here though, everybody was so friendly and helpful, there was no shame in making a mistake, we were all learning together. William’s teaching kept us all on our toes. With a mixture of watch and learn and cooking in pairs we were always busy, always learning and certainly always having fun. Our first dish, Mushroom, Leak and Gruyere Tart, was simple to make, tasty (very tasty) and looked so good on the plate. As we all sat down for our morning break to eat the dish that we have produced I could see a lot of camera phone action taking place, myself included, as we all wanted photographic evidence of the grandeur of what we had produced. Once back in the kitchen it was straight back to work – no rest for the wicked in this environment. Before we knew it the time had arrived to plate up our food ready for service. This was, by far, where I impressed myself (and my twitter followers), the most with my creative skills. The two final dishes, Roasted Cod with crushed new potatoes, pea puree and saffron foam, and Pork Fillet wrapped in Parma ham with an Aspall’s cider cream and mustard sauce looked great and I couldn’t resist showing off my handiwork. The day ended with us all sitting down together as a class, sharing a glass of wine, and tucking into the wonders that we had produced. Talking to my classmates during the day I found that for many of them this was not their first course. I can see why, this cookery school is brilliant, and with the gift vouchers that Braxted Park sell, the classes also make great presents for loved ones. I know what will go on the top of my Christmas list this year. If you can’t wait till Christmas though they have some very interesting courses coming up throughout the summer, who could resist ‘Cooking with chocolate – sweet & savory’ on August 14th? It’s certainly a good way to escape the summer of sport for a few hours and indulge your sweet tooth. Get £20 off any cookery course at Braxted Park Cookery simply by quoting ‘Inspired’ when you book! 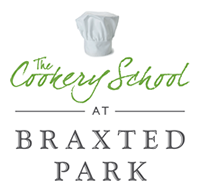 For a full list of courses visit www.braxtedparkcookery.co.uk or call the office on 01621 890300. This entry was posted on July 12, 2012 by inspiredessex in Chatty, Dine in Style, Essex Events, Ladies Time Out, Offers and Competitions and tagged Alice Langley, braxted park cookery school, Chelmsford Magazine, inspired chatty, Inspired offers.